This lecture was built upon the following premises: first, any action within the cultural landscape performed from a minoritarian position will be perceived by authority as contestational act; and second, once challenged any or all of a variety of disciplinary agents will be sent to restabilize the discourses of the status quo through the managing or silencing of resistant cultural production. 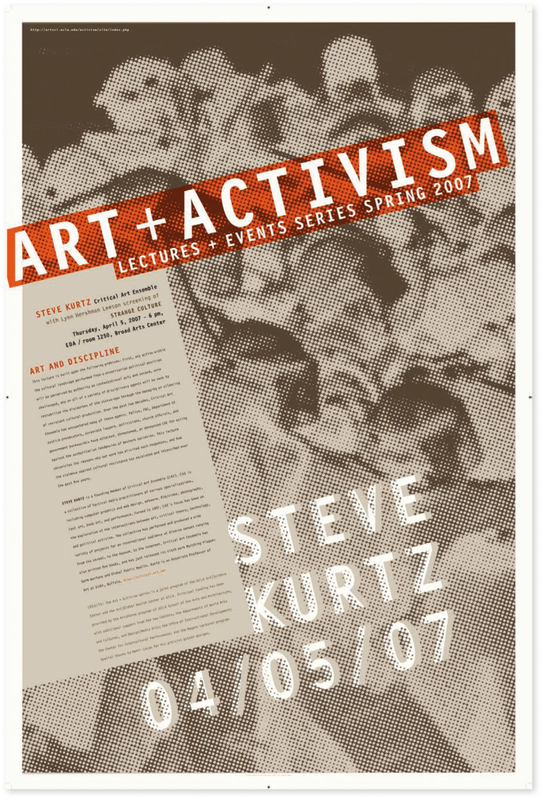 Steve Kurtz is a founding member of Critical Art Ensemble (CAE). CAE is a collective of tactical media practitioners of various specializations, including computer graphics and web design, wetware, film/video, photography, text art, book art, and performance. Formed in 1987, CAE’s focus has been on the exploration of the intersections between art, critical theory, technology, and political activism. The collective has performed and produced a wide variety of projects for an international audience at diverse venues ranging from the street, to the museum, to the Internet. Critical Art Ensemble has also written five books, and has just released its sixth work Marching Plague: Germ Warfare and Global Public Health. Kurtz is an Associate Professor of Art at SUNY, Buffalo.